Having decided this morning to go on a family trip to Wisley Gardens for a Mothers Day outing, we popped into Waitrose briefly for a few supplies. Mrs WP went in do the business while I sat in the car with WP Junior and after about two songs from the radio she re-emerged with shopping bags in hand. So far so normal. 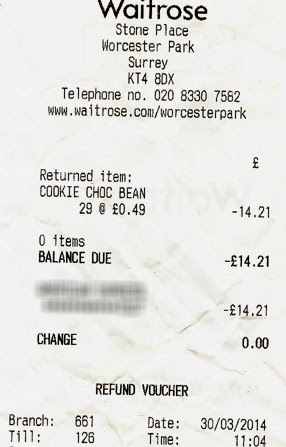 As we moved off again she decided to have closer look at the receipt, it having occurred to her that £21.40 was a bit much for a few groceries. It seemed the three biscuits she had bought for us has somehow been charged as 32 biscuits and while they were doing a wonderful deal on these biscuits (which they insist for some reason on calling 'cookies') whereby the knock 9p off each one bought as a set of three, 32 of of them was still a bit over the top. Luckily we hadn't quite reached Lynwood Drive yet so I did a quick drive round the block and she went back in to sort out the issue. To their credit the staff there sorted it out immediately, organised a refund which was of the face value of the biscuits before the discounts were applied so she ended up getting a couple of pounds extra back too (Hooray).